The Yoga Roots invites you to sunny Malibu, CA for a full day of beachfront yoga! A beautiful private studio overlooks the seemingly endless sea, allowing you a deeper sense of connection to your practice. Led by The Yoga Roots instructor Crystal Lindahl, we will all come together to practice yoga and enjoy a delicious lunch while watching on as the waves ebb and flow. You might even see a few sunbathing seals or the resident dolphins that play near the shore! Our plan for the day: Arrive, meet new friends! We will then go right into a powerful and fun 90 minute flow yoga class, have an amazing lunch overlooking sparkling Malibu waves, transition into a badass workshop on how to create and manifest the life of your dreams, and finally we’ll finish off the day with a 2 hour long revitalizing restorative yoga class. Possible downtime activities could be: Explore the property, relax in any one of the many lounge areas overlooking the beach, bring a book to read, take a nap, take a shower …. unwind any way you choose! The Yoga Roots invites you to beautiful Sedona, Arizona! Originally the residence of the Native Americans, located on 163 acres, Sedona Mago Retreat is your ultimate getaway! Surrounded by red monoliths, Native American ruins and majestic mountains. Designed to work with the healing energy of Sedona, you can relax and rejuvenate. Get away from the demands of daily life for 4 days full of fun, sun and yoga! Here, you will have the opportunity to recharge—to practice yoga and enjoy fresh gourmet meals. A typical day: Wake up and eat breakfast, chill, a fun 60-75 minute flow yoga class, either eat lunch on the property or go into town/take an excursion, dinner, enjoy the beautiful Sedona sunset, either chill at the spa under the stars or enjoy a relaxing specialty class. Possible daily activities and excursions could be: explore the property, get a healing treatment in Sedona, nap, drive into downtown Sedona, Pink Jeep tour, explore historic Jerome, wine tasting, explore Cottonwood/Clarksdale, Kayak on the Verde River, float the Salt River, hot air ballon tour, horseback ride, ATV/RZR tours, Montezuma's Well, Slide Rock falls, take a dip in the pool, hang out at the spa….or do whatever you like! The Yoga Roots invites you to beautiful Sedona, Arizona! Originally the residence of the Native Americans, located on 163 acres, Sedona Mago Retreat is your ultimate getaway! Surrounded by red monoliths, Native American ruins and majestic mountains. Designed to work with the healing energy of Sedona, you can relax and rejuvenate. Get away from the demands of daily life for 5 days full of fun, sun and yoga! A typical day: A 60-75 minute flow yoga class in the morning and a 60-75 minute flow yoga class in the evening. Time in between classes: explore the property, get a healing treatment, nap, drive into town, take a dip in the pool or hang out at the spa! We had so much fun in beautiful Ojai at Peppertree Retreat Center. Located only 90 miles outside of Lancaster, this hidden getaway provides the perfect combination of natural beauty and comfort. Pepper Tree Retreat is located on 11 acres of orange orchards, gardens, and open space nestled in the foothills of Ojai's magical east end. There are several outdoor patios and terraces, with a large veranda overlooking the front lawn and rose garden. Nearby are trails into the surrounding mountains and country roads ideal for early morning or late-afternoon walks. Yoga is offered twice daily in the Yoga Pavilion. The Pavilion is a hexagon structure with a 50ft cross section and is tucked away between orange trees in a quiet corner of the resort. Every morning we will take a morning mediation walk through one of the nearby trails and during the time between meals you can relax at the retreat, take a drive to the beach or go get a massage! Pura Vida Resort... a gorgeous coffee draped mountainside gated estate in Costa Rica’s Alajuela Province, for a week of power flow yoga and gourmet meals. The altitude of 4,900 feet above sea level, allows for breathtaking views of the valley below, volcanoes on the horizon and the most spectacular displays of mother nature’s diversity with the changing seasons. Get away from the demands of daily life to a place of serenity and awe-inspiring beauty for a full week. Here, you will have the opportunity to recharge—to practice yoga and eat mindfully. To walk through a coffee plantation and soak up the best of exotic Costa Rica! Pura Vida Cuisine: We will gather together in a gorgeous dining room overlooking acres of the coffee plantation, along with views of Costa Rica’s central valley. The restaurant serves vegetarian fare and fresh seafood. Let us know if you have particular dietary requirements, and we’ll do our best to accommodate you. 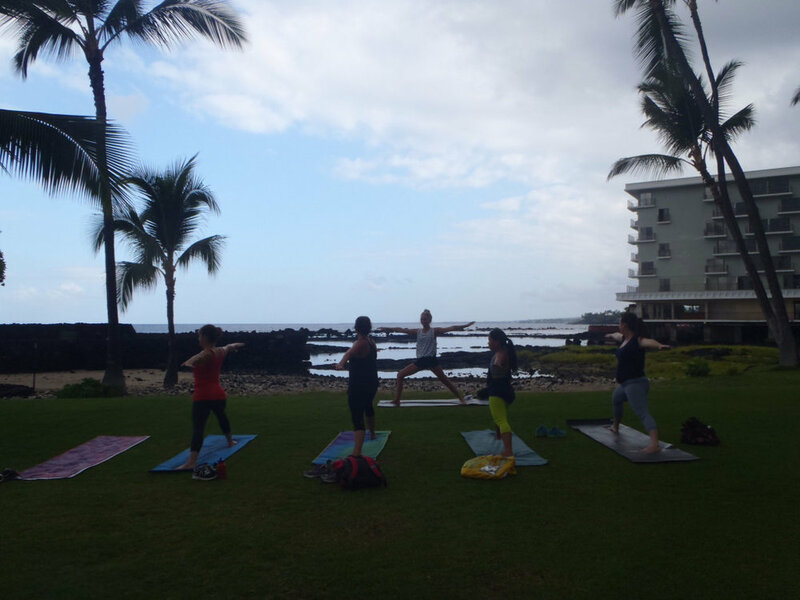 Join The Yoga Roots for a week long yoga retreat in the sun and sand of Kona Hawaii. The retreat is held in a private home in Na Hale O Keauhou, just a short walk to the beach. This getaway provides the perfect combination of natural beauty and comfort. (famous for its sunning turtles), visit Volcanoes National Park, walk through the Thurston Lava Tube, visit Historic Hilo, take a scenic drive up the Hamakua coast, see waterfalls and have a end of day yoga session at “the secret spot” in front of a waterfall (for those of you courageous enough you can swim across the swimming hole to a wonderful rope swing). All the retreats meals will be vegetarian with some local fish that we will BBQ! All meals will be an interactive experience to learn the yummy fun ways to cook a healthy meal!